Amsterdam, The Netherlands, 15 September 2016 – Shenzhen Skyworth Digital Technology Co. LTD. (000810.SZ), a leading set-top box (STB) and broadband device provider, today announced its IBC 2016 stand was Highly Commended in the Best Larger Free-Design Stand category, as the company hailed IBC 2016 as a resounding success. Skyworth Digital was one of more than 1,800 exhibitors to have its stand judged according to its creativity, impact and how fit-for-purpose it was. The stand’s attractiveness, to what extent the design reflects the company’s corporate image and signage around the booth was also considered by the judges. With a showcase of Skyworth Digital’s full product range of set-top boxes, OTT solutions, broadband and mobile devices, the company was able to show visitors its vision for the future digital home and highlight how tomorrow’s trends can be integrated and packaged in solutions today. Skyworth Digital representatives were also on-hand to demonstrate the value and high-quality solutions available for thousands of visitors and delegates, with a particular focus on the new products launched by Skyworth Digital during IBC 2016 – including miniStation, a first-of-its-kind OTT gaming console launched in partnership with Tencent Holdings. During IBC, Skyworth Digital also announced it will provide multiple next-generation STBs for a project led by Dish Mexico. 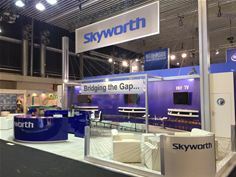 This is the latest in a line of successes for Skyworth Digital, with its latest company figures revealing that the company shipped 30 million STBs globally during 2015 – more than 50 per cent of which came from international sales – making Skyworth Digital the third largest STB manufacturer in the world.